Today was Art & Craft Circle. We were supposed to meet in the library, but the weather was so beautiful, we had it outdoors in a nearby park, instead. 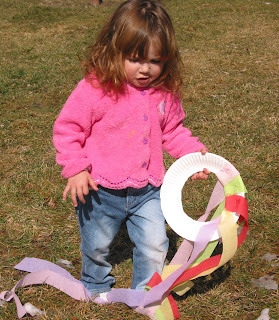 My children didn't participate in making crafts, but they had a grand time running and playing in the playground! Melissia hosted, and we made magic treasure boxes, rainbow mobiles, and some fly-streamer things. I made one for Maddie, I thought she might enjoy it with the breeze. 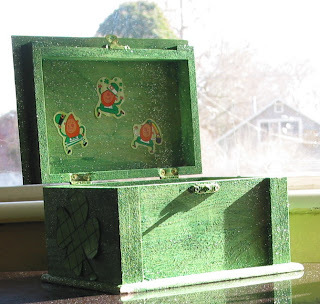 I also painted our Treasure Box, I'm looking forward to an evident visit from the leprechauns! Full of magic and trickery, the leprechauns remain in their hidden world until the night before St. Patrick's Day. On that one night of the year they appear throughout the world to dance and sing and frolic. Disguising themselves as leaves and grass, and sounding like the wind and the crickets, they come and go unnoticed. However, it is said that if a decorated treausre box is left empty under the moon, the leprechauns ust fill the box with gold or jewels or gifts. But then they will hide the box in the most unlikely of places. If the box is found on St. Patrick's Day, the treasure remains in our world. If not, the leprechauns may retrieve what is rightfully theirs. And though the leprechauns are are very clever, it is not impossible to find the treausre because, unknowingly, leprechauns often leave a trail of greenery behind them.